Easy no bake cheese cake is the perfect recipe for when you are looking for something easy to make, but you want it to look fancy. 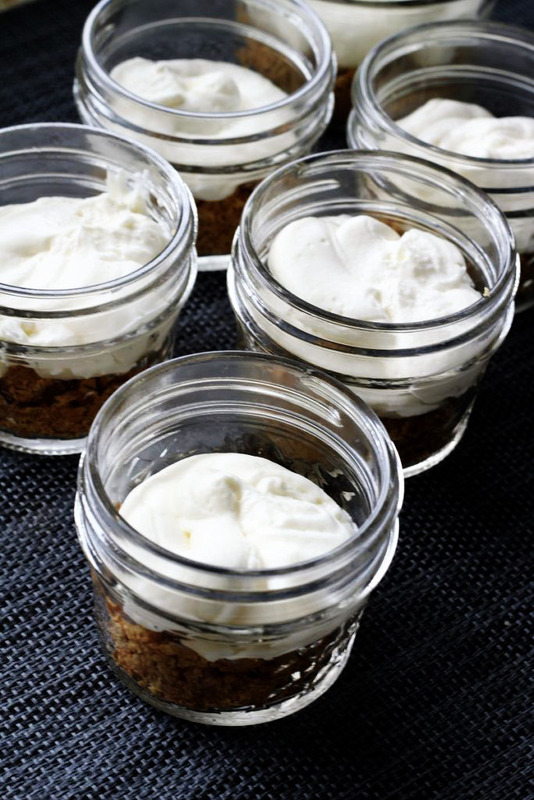 We had some friends over the other night, so I decided rather than put the cheese cake in a 9″ X 13″ pan, I would have it all ready to serve in these cute little jars. I scooped about 1/8 cup of the crust in the bottom of each jar. Then, I got out my cake decorating bag and put some of the cheese cake filling in the bag and swirled it around in each jar. Then I chose cherry pie filling and sure enough, it just hit the spot. I loved just being able to hand one to each of my guests and then put the jars in the dishwasher. It was a piece of cake! (cheesecake that is) ha ha! I had a couple of them left over so I just put the lid on them and they lasted in the fridge for two days. They tasted amazing even after a few days. I remember when I had this cheese cake at a family party. My Aunt Linda gave me the recipe. I knew right away that I had to have this recipe for easy no bake cheese cake! I have been using it for years. When I was first married, I made it in my 9″ X 13″ cake pan and it had a nice lid. We had a maroon Dodge Omi car with gold wheels. Hey don’t judge me, it was a great price. I paid $3,000 for the car. That was while I was working and going to cosmetology school. I would go to school until 5:00 pm and then I would go to work. I worked in a fabric shop and there were four of us. We would cut these big bolts of fabric into smaller flat folds and then stack them on a shelf. They had the nicest knit fabrics and some times we would even buy some. I have a friend who came in with a cute sign that read.”he who dies with the most fabric WINS”. I think that it will be her; she is one amazing seamstress and she is always making something and giving it away. She has made me some of the cutest aprons ever. I just might have to post one one of these days. But now back to my car. We put this pan with a couple of pieces of this easy no bake cheese cake on top of the car, (the car had racks on top), and I guess that we forgot about the pan and we drove off down the road. I told my husband, I just saw something fly off the car. Yep, sure enough, we went back and there was my poor pan and the cheese cake on the road 🙁 The lid was broken but I went home and washed that pan up and I have never been able to find anther pan that I like as much. I think if my pan could talk, it could tell a lot of stories of times around the dinner table, and different dinners that we have enjoyed through the years. 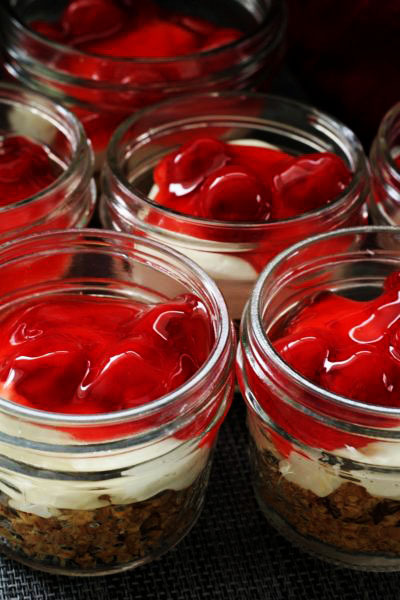 I invite you to try making this easy no bake cheese cake today. Just make sure that you have someone to share it with because I wouldn’t want you to have to eat it all by yourself. I know that I sure could. It really doesn’t matter if you put it in a 9″ X 13″ pan or in little jars, it will be delicious ether way. I have also used whipped topping before, but I just love real cream so that is usually what I use. I hope that you are enjoying your summer and that it is bringing you a lot of good memories with family and friends. Oh ya, if you have a picky son like mine, just leave one of your cheese cakes plain, or not – and that way you can eat it. Enjoy! In a 9" x 13" pan, crush the graham crackers or place them in a blender and blend, depending on how fine you like them. Then melt the butter in a microwave proof bowl for about 30 seconds. Make sure that you have a microwave safe lid on it. Add the butter to the graham crackers, along with the 3 Tablespoons of sugar. If you want, you can bake in a 325 degree oven for 10 minutes, this helps it stay together better. I put mine in little cups and I did not bake it this time. In medium bowl, whip the cream. When it is nice and thick, blend in the sugar and vanilla. In a separate bowl, whip the cream cheese. Then add it to the whipped cream. Place this mixture on top of the graham cracker crust. Then add your favorite pie filling. Love this idea, looks like easy Heaven in a cup! Thanks for sharing with us at the To Grandma’s House we go link party! Thank you Grandmas House DIY! They are heaven in a cup and very easy too. Thank you for all you do! 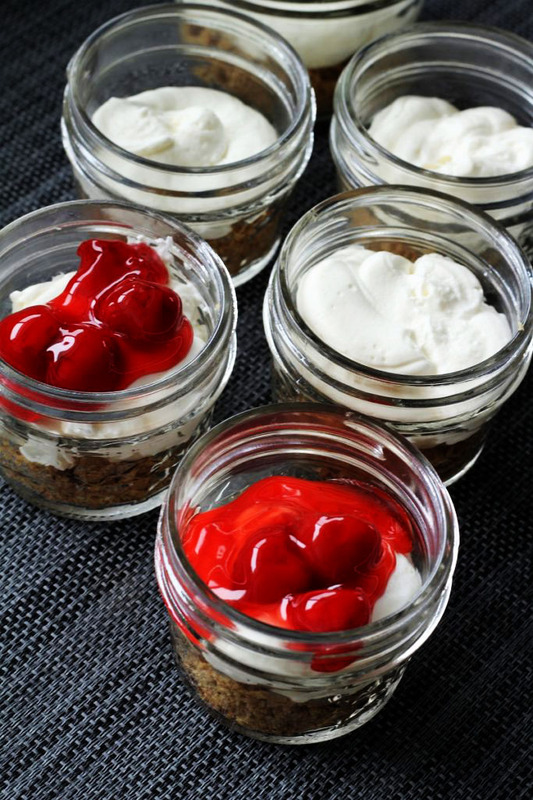 I love serving treats in little jars like this. Thanks for sharing at the What’s for Dinner party! Thank you for the party and for coming by and leaving a comment. This is the first time that I had served something like this in little jars and it really was fun.